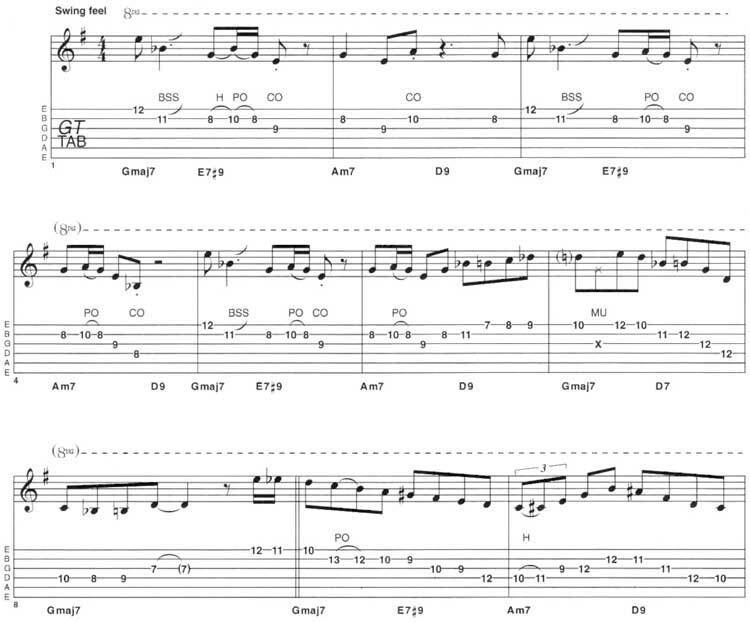 In the part two of this rhythm changes lesson, we’re speaking about soloing ideas. The easy tempo keeps this within range of most players. In previous lesson, we looked at one of the more common chord arrangements in jazz. To recap, it all started with Charlie Parker’s fascination with the Gershwin song ‘I Got Rhythm’. He enjoyed playing over the changes so much that he based several of his own compositions on the same series of chords. In this way, this set of chord changes has entered jazz lore to almost the same extent as I-IV-V changes have entered rock’n’roll and blues. I suppose we’re operating a buy-one-get-one-free policy here: learn these changes and you’ll be able to play over loads of jazz tunes. So, in last lesson, we considered two different versions of the chord arrangement. Firstly, we looked at a very basic interpretation (followed by a slightly more ‘arranged’ one) and this time, we’ll look at some soloing ideas which fit over the top. In the version you’ll hear on the audio track, we’ve kept the accompaniment very straightforward so that you can hear the single-line ideas work over the chords in pretty much their native state. As usual, I’m not going to intellectualise what I’ve played over the chords; I just don’t think that way myself. I believe that if you familiarise yourself with the transcription you will find that you can take what you’ve learned further by adding ideas of your own. Being able to recite a list of scales that you could play over a certain chord is, I believe, a very sterile approach – although it works for some. Music is far more organic than that and often disobeys all the rules that academics would have you believe. When I play single-note material, as opposed to chord melody, I don’t always use a plectrum. When I play with my band, I have to in order that the acoustic guitar gets heard above the other musicians in the band. In fact, in that band I can wear out a set of strings in the first half of the concert because I have to play a lot more dynamically. But it really depends on the context. I think that playing with flesh as opposed to plastic actually sounds better – that old thing about actually touching the string to produce the note instead of by proxy using a pick. But playing single lines fingerstyle has its limitations. Unless you are a top-flight classical player like John Williams, attaining the necessary turn of speed for some of the up-tempo material-is very hard indeed. I have adopted a fingerstyle technique which is unorthodox, if viewed in the light of what a classical player would do. For instance, instead of using a regimented ‘index – middle -index – middle’ I tend to use whichever finger is handy at the time. It’s a system that works for me, but I would recommend that you tackle this lesson’s solo using a pick if that is what you are used to. Another thing that I believe very important to remember is that you’re playing a tune when you take a solo. To this end, you have to try to build something which has a shape and life all of its own, but never strays too far from the original melody of the piece – and certainly doesn’t contradict the mood. If you copy some of the licks or phrases in this solo, try adjusting them rhythmically and mixing them up – this is often a way to begin to create your own original ideas. © 2012 - 2019 TabsClub Powered by TabsClub 42 queries in 0.581 seconds.